Better than and worse than J.Lo’s dress is better than Sarah’s. Mejor que (better than) Los estudiantes dicen que la clase de historia es mejor que la clase de ciencias. The students say that history class is better than science class. Peor que (worse than) Yo creo que el fútbol es peor que el baloncesto. I think that soccer is worse than basketball. Descargar ppt "más + adjective/adverb/noun + que"
Future with ir Forms The verb ir followed by a and an infinitive expresses future intent. Functions To express an intent to do something or to be a certain. Making comparisons Cap. 1B, pág. 53. How do we describe someone or something? Ser + adjective Brad Pitt es muy guapo. Not just descriptions….. what about. Comparisons. English: John is taller than Susie. Spanish: John is more tall than Susie. Spanish: John es más alto que Susie. Formula: 1 st subject + verb. 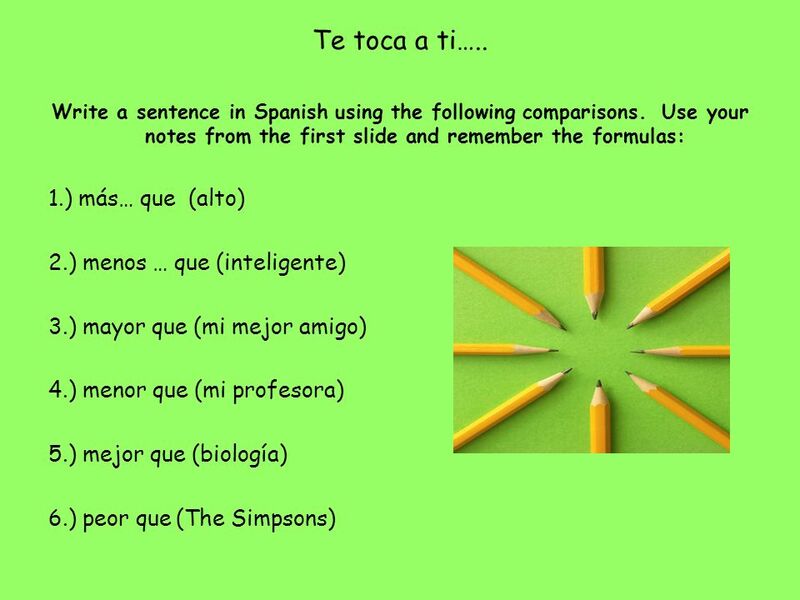 COMPARISONS COMPARISONS I want you to write down 3 comparisons using the words MORE, LESS, or AS. EXAMPLES: She is more athletic than Mike. He is less. Superlatives Page 280 Realidades 1. 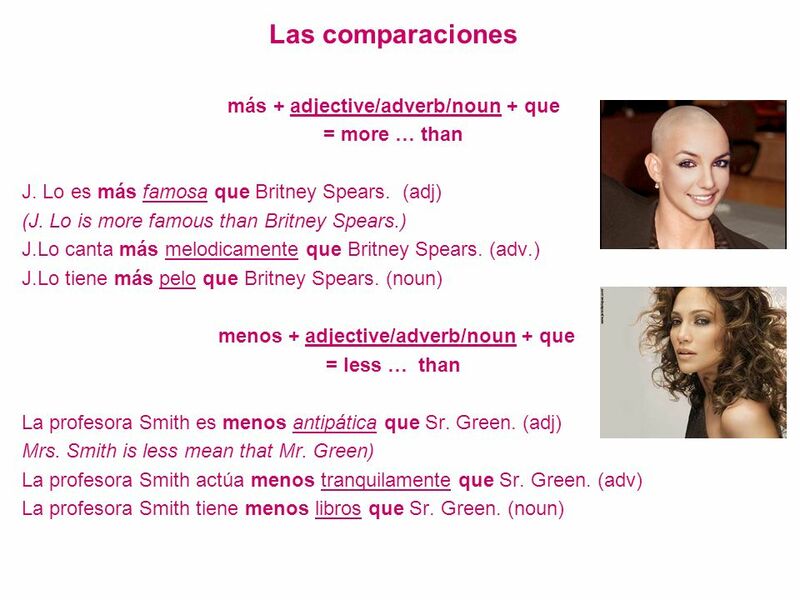 Comparatives Page 278 Realidades 1. 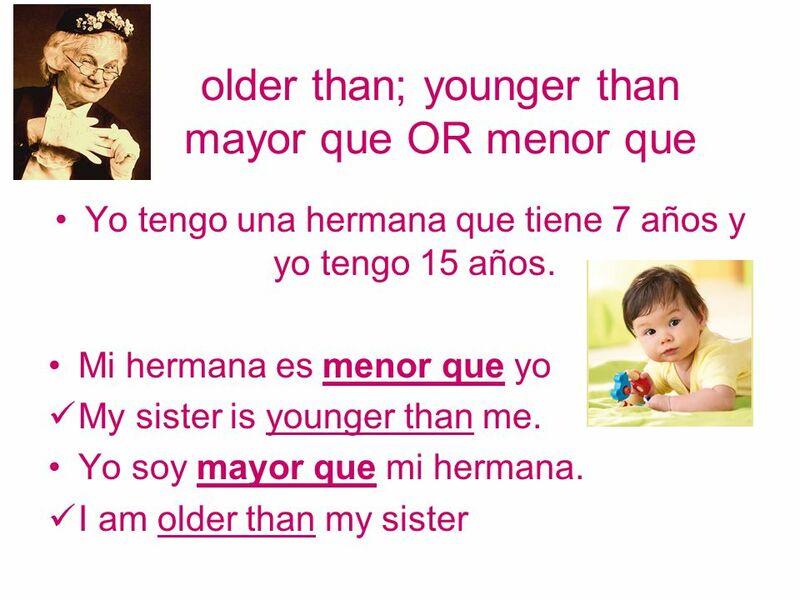 Making Comparisons in Spanish Sp. 3 (H) c.4. Comparisons of Equality 1. Tan + adjective/adverb + como El libro es tan grande como el otro. 2. Tanto/a/os/as.